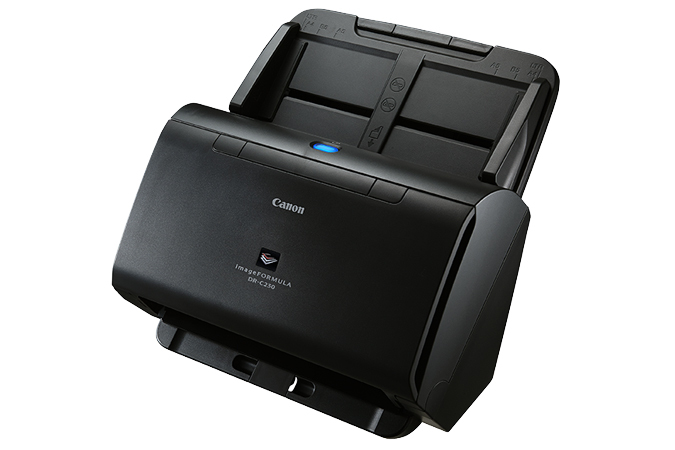 Help boost office efficiency and productivity with the user-friendly Canon imageFORMULA DR-C230 office document scanner. With its powerful document capture capabilities and dynamic ability to scan various document types like passports, this scanner can easily convert paper-based documents into high-quality digital files for almost any office environment. Designed with the user in mind, the DR-C230 scanner’s easy-touse operation panel contains accessible controls to start scanning operations, preconfigure job tasks, and more with one-touch job buttons. The DR-C230 scanner can scan at up to 30 ppm, both sides of an item in a single pass, in color or black-and-white. Capable of holding up to 60 sheets, it can handle a variety of document types including thick, thin, long, or oversized documents; plastic or embossed cards; and even passports for greater versatility and flexibility. Equipped with double-feed release functions and one-touch release button to allow scanning to resume when double-feed is detected for a seamless and more efficient scanning experience. Auto Resolution setting, useful for scanning mixed batches of documents and photographs by automatically adjusting the output resolution to improve quality and reduce image file size. The DR-C230 scanner meets ENERGY STAR® guidelines for energy efficiency.